Nepal is the birthplace of Gautam Buddha and Buddhism. Lord Buddha was born in the Shakya Kingdom of the Kapilvastu which now falls in the Rupandehi district in the Lumbini zone of Nepal. While nobody is sure about the exact birth date of Buddha, it is speculated to be around 623 BC. About 11% of Nepalese are Buddhists and are primarily from Tibeto-Burman ethnic groups like Tamang, Sherpa and Bhotey. Hinduism has absorbed Buddhism to a vast extent, but the two religions are intertwined in such a way that they share many temples and deities. Buddhism’s influence is so pervasive in most aspects of Nepali society that you will have a hard time distinguishing them from Hindu ones. Buddhist monasteries are a distinctive and unique landmark across Nepal, and luckily, there are several of these in and around Kathmandu Valley. While devout followers visit these monasteries daily for religious purposes, these landmarks also attract several other visitors with their architectural excellence. Here are some monasteries to visit when you’re in Kathmandu. Only a stone’s throw away from Boudha, UNESCO World Cultural Heritage Site and the largest Buddhist stupa in the world; Kopan Monastery is a Tibetan Buddhist monastery located on a hilltop. The monastery follows the Gelung tradition of Tibetan Mahayana Buddhism under the guidance of His Holiness Lama Zopa Rinpoche. There are more than 360 monks, teachers, lamas, and other workers. In addition to meditation retreats, Kopan monastery also offers elaborate courses on Buddhism and its practices in affiliation with the Foundation for the preservation of the Mahayana Tradition (FPMT). One can learn immensely about the Mahayana Buddhist tradition and values through teaching, community, and meditation. 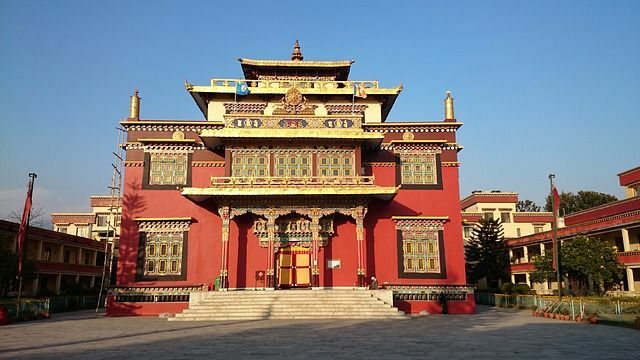 The story of Shechen Monastery is as exciting and fascinating as its architecture. Located in Boudha Nath, the monastery is one of the six “mother” monasteries of the Nyingma tradition of Tibetan Buddhism. It was initially found in Tibet, but was destroyed during the Cultural Revolution of the 1950s, and was rebuilt in Nepal in 1985. The present abbot of Shechen monastery is the seventh Shechen Rabjam Rinpoche, the grandson of Vajrayana master, Dilgo Khyentse Rinpoche. Today, the monastery serves as the main seat of the Shechen tradition in exile. There are currently more than 300 monks at Shechen monastery. The monastery actively conducts classes on Tibetan-Buddhist dances, paintings, music, and philosophy. It also has an elementary school branch that offers education to children between five and fourteen years of age. Thrangu Tashi Yangtse Monastery, popularly known as Namo Buddha, is situated 40kms southeast of Kathmandu. Perched on the top of a hill, the Thrangu Tashi Yangtse monastery is a sprawling Tibetan Buddhist monastic complex with glistening golden arched roofs. Laden with colourful prayer flags, the monastery itself looks palatial. On a sunny day, you can have amazing views of central mountains like Langtang Lirung, Jugal, and Ganesh from here. It is the holy site where prince Mahasatwo cut off his body to feed a hungry tigress and its cubs some 6000 years ago. It is believed that some 3500 years later, Buddha came to the same place, toured the stupa thrice and declared himself to be the reincarnation of the prince. Due to this holy myth associated with the site, the monastery is highly revered by Hindus and Buddhists alike. Also, popularly known as White Monastery or SetoGumba, Druk Amitabh Mountain is undoubtedly the most famous monastery of Nepal. Located on a northwestern hill near Swayambhu Nath Stupa, the monastery is visited for religious and recreational purposes alike. It is also easily accessible on foot, or by bus or taxi. From an architectural perspective, the monastery is just outstanding. The walls are decorated with Tibetan murals, paintings, and statues depicting Buddhist teachings. It is also a great vantage point to see the landscape of the beautiful Kathmandu Valley. On a clear, cloudless day, you will be gratified by the fantastic views of the Himalayas from here. Located some 26kms away from Kathmandu, near the town of Banepa, Dhagpo Sheydrub Ling Monastery is a beautiful but highly unidentified and underrated monastery. Built atop a hill like every other monastery in Nepal, it boasts of beautiful and rich architecture depicting the richness of Buddhism. Stunning, intricate murals, paintings, and statues adorn the walls of the pagoda-style monastery while glistening golden roofs only add more beauty to the architecture. Although very easily accessible from Kathmandu, the monastery is lesser known than its counterparts from Kathmandu. That might serve as an advantage because it won’t be crowded with tourists and tarnish your experience.